The liturgical season of Advent has arrived. 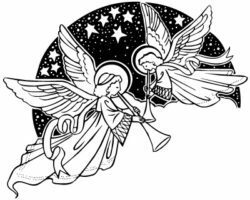 The Christmas decorations are going up, the gifts are being purchased, the cards are going out, the travel arrangements are being made, the Christmas Eve services are being prepared…but what about Advent? Often times, we are so busy with not only our daily lives, but also the pressure of getting ready for the Christmas holiday that we forget to prepare for Christmas in a meaningful way. Advent, as defin ed above, can refer to both the coming of Christ (at Christmas) or the second coming of Christ in the end times. Sometimes we place more emphasis on the coming birth of Jesus, and less emphasis on the Parousia, or second coming. However, our scripture readings and hymns during the Advent season remind us to be alert and keep watch. One of my favorite Advent hymns is known as the king of all chorales, Sleepers, Wake! A Voice Astounds Us. The tune, originally composed by Philipp Nicolai in 1599, has been beautifully arranged in both simple and absolutely epic musical settings – Max Reger’s Chorale Fantasia on ‘Wachet auf’ being among the most grand and worth a YouTube search. This chorale is home to a text, also by Philipp Nicolai, that is fitting for this time in the liturgical year. The first stanza calls Christians to be alert for Christ’s second coming. The watchmen, who usually would warn of approaching danger in this case are announcing that the coming of the Lord is a time for joy and singing. Stanza two depicts the joyful scene in which the Bridegroom returns to take His church into the wedding feast, making the connection with Holy Communion, the foretaste of the heavenly feast that is to come. And finally, the third stanza describes the glorious heavenly scene where saints will worship in song forever, as depicted in the book of Revelation. I look forward to our worship services this Sunday where you will not only hear three different settings of this “king of all chorales,” but also join together in singing this great hymn. Our Sunday services, Thursday morning chapel, and weekly Advent devotionals are great opportunities for you to prepare during this season. I hope you will be able to join us in experiencing Advent at St. Stephen. Peace be to you and grace from him who freed us from our sins. Who was and is, and is to come; sing holy, holy, Lord! They need no light, nor lamp, nor sun; for Christ will be their all!